Double high large windows cover the entire façade of the corner building and spill in plenty of daylight, creating a direct link between the interior and its surroundings. The windows are a focal point in the design and concept of the interior, mirrors hang from the ceiling reflecting light and the scenery. A train, running by opposite the café, creates a flickering reflection which is captured in the bar back wall with the diverse use of colour, fabric and mirror strokes. Located on the entresol and souterrain the dining area is separated from the rest of the interior. 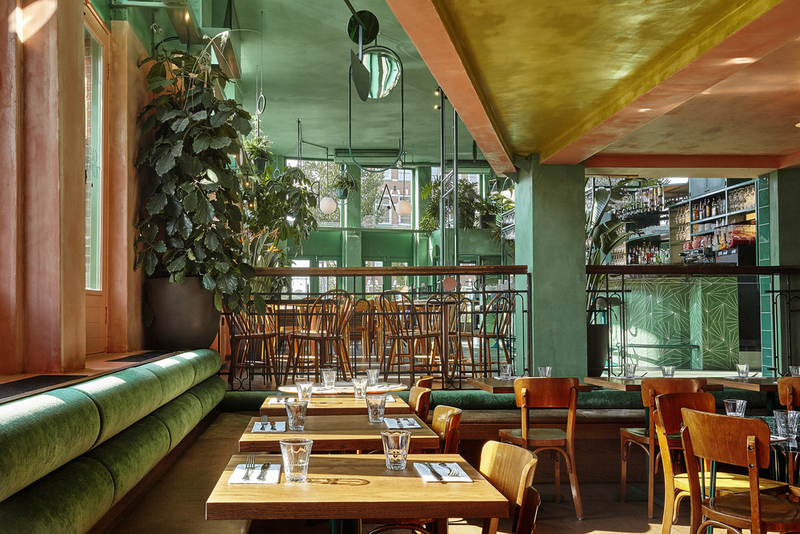 Warm pink walls, a flower press menu-board and green velvet bench rolls give the souterrain a special character of its own. 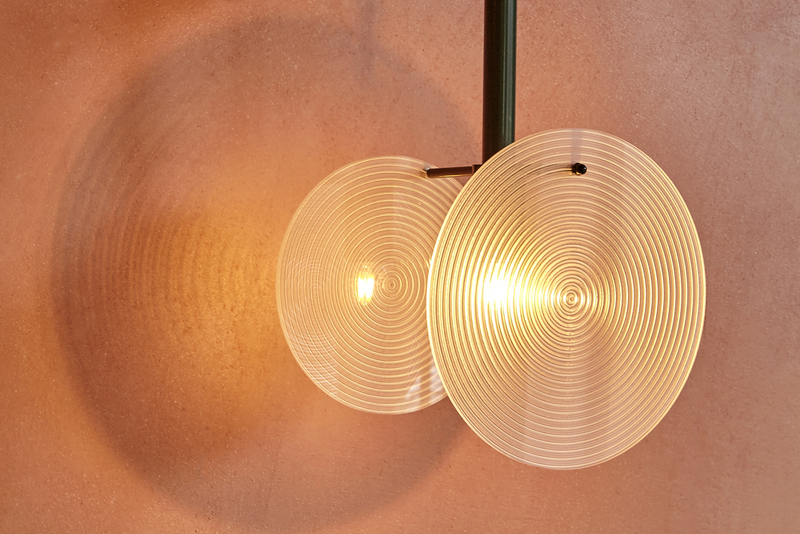 Custom light fixtures which are made using simple glass plates with engraved circles on them create pleasant circular shadows along the wall up to the ceiling. 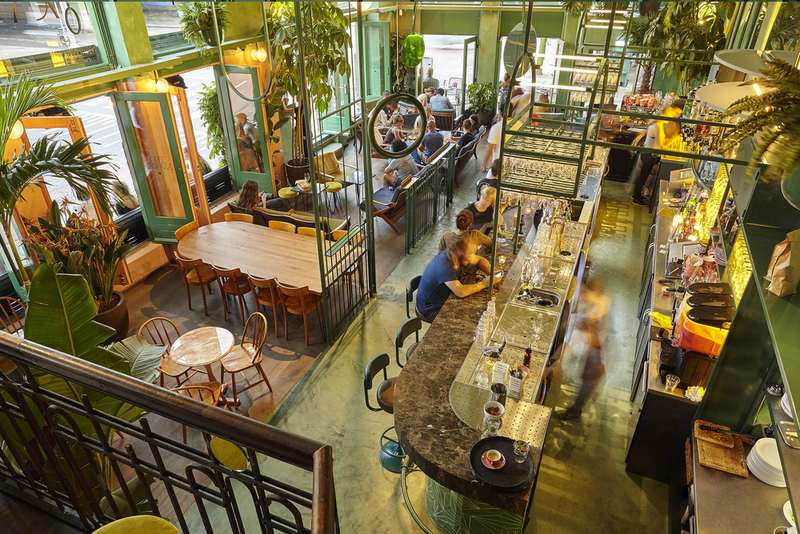 The botanical sensation of the space is visible in the colour scheme and the organic shapes which form the bar front, bar back wall, the hanging mobiles and lights. A rich colour pallet inspired by nature is used for the furniture and compliments the interior. 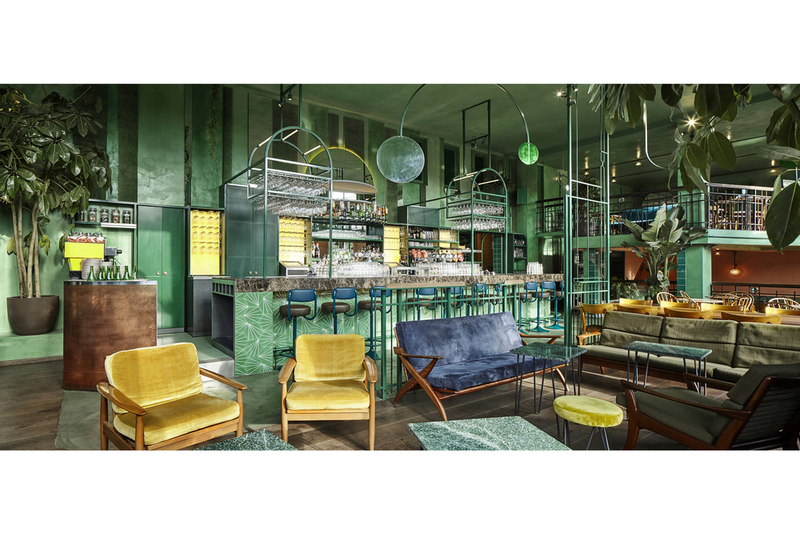 Colorful marble table tops in green and pink stand by velvet banquets which reflect the identity of the former café in their details. A stroke of bright blue, the lounge chairs, appear in the interior in front of the bar with the brown marble top, giving it yet another colour boost. The bar front, tiled in a tropical pattern with a marble counter top is complimented by a completely custom made back bar. It consists of a composition of rounded shapes, metal mesh and light boxes, with a centre piece showcasing the bottles. A bright yellow coffeemachine shines in the custom made copper coffee corner, adding another touch of colour to the space. Plants have a strong presence in the interior. Palm trees, philodendron, ferns and monsteras create an ever changing interior. 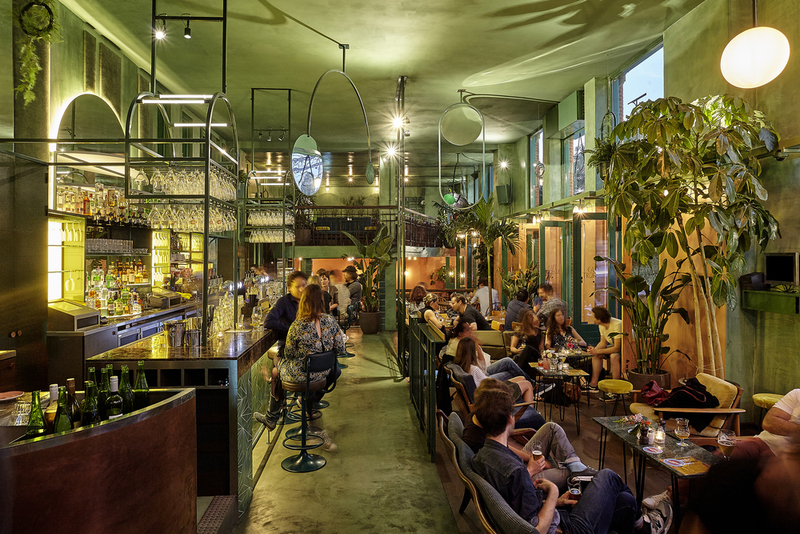 Highlighted with lamps, the plants create dramatic effects on the ceiling and walls, as the sun goes down the shadows become more present and the bar life begins. Logo design and identity has also been completed by Studio Modijefsky. A custom font has been designed for the logo to reflect the playful nature of the concept, it appears in the interior on custom signage. The logo wraps around the building on the facade, each letter on a window forming BAR BOTANIQUE all the way around the corner. The house number, 581, can be seen on the main entrance glass door while the number 8 forms unique and custom made door handles. The menu design follows the design principles of the interior, organic shapes and the custom font have been used to make collages. 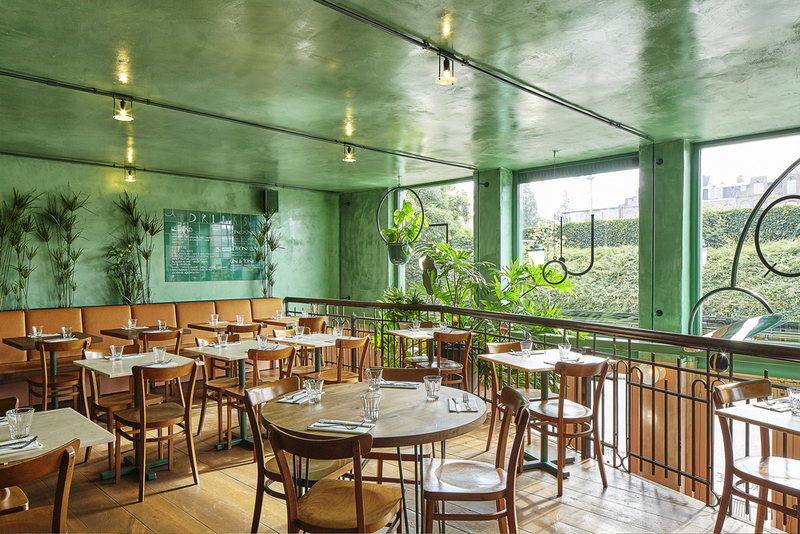 Organically shaped, the forms on the menu take their colours from the interior design. The collages form an artwork which is used as a canvas to design a random, unique and tropical menu for this botanical café.